Area Five, a rocky intertidal area of northern San Luis Bay, begins at the Northermost end of the 26 mile stretch of sandy beach called Pismo Beach. From this rocky cliff area along the coastline to the southern end of Avila Beach, another high rocky cliff, the boundary arcs offshore to the 200 meter bathymetric line back to the Pismo Beach rocky cliffs in order to protect prominent offshore rock habitat in the San Luis Bay. Along this stretch of coast is a major complex of kelp forest; none are found southward until Point Sal. The coastline varies from rocky cliffs with no beaches to cliffs with some beach. Despite the beach areas, the dominant rocky hard bottom offshore provides appropriate habitat for the kelp forest and its lush populations of plant and animal life. The area is host to the last significant southernmost population of southern sea otters in the Southern Sea Otters Range. In 1990, it was ranked as the sixth largest population cluster. Since then, the population has fluctuated up and down. The reason for these fluctuations remain under study. Pollution from onshore is considered the most likely cause or causes. 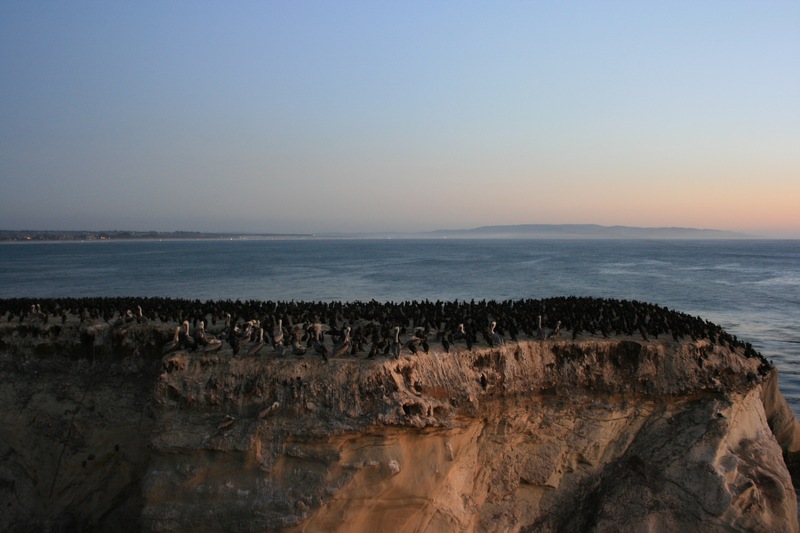 High cliffs, intertidal rocky areas, beaches along the feet of the cliffs, and nutrients from a nearby upwelling provide a rich environment supporting otters, other sea mammals such as porpoises and sea lions, and large numbers of other species in the web of life. 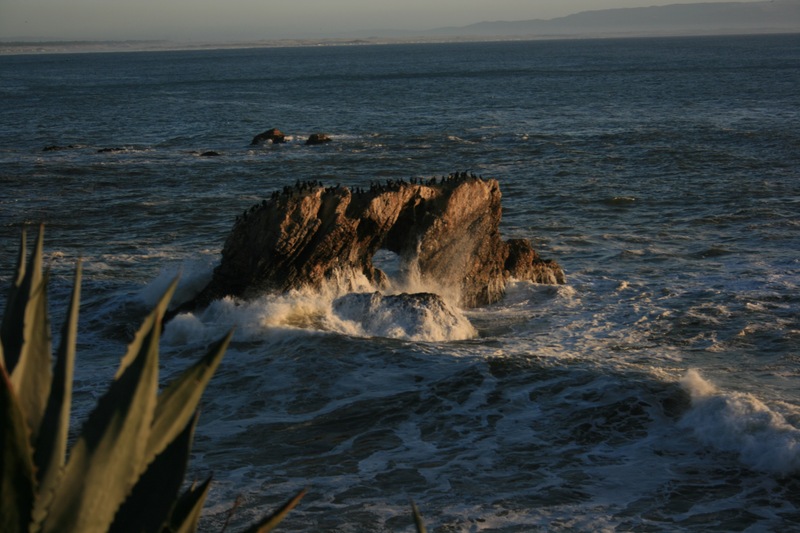 Numerous offshore rocks provide bird and pinniped habitat. Hundreds of Brown Pelicans, for example, reside in the area. Their numbers swell in the late spring, and remain high until late fall when most return to the Channel Islands for breeding. Harbor seals haul out among and on the rocks. A resident population of harbor seals offshore Shell Beach is a source of enjoyment for people living in the area or visiting. Porpoises visit the area often. Gray whales pass southward and northward during their migrations. Giant flocks of Sooty Shearwaters feed here in the summer during their travels around the Pacific basin. Huge schools of anchovies moving through are a food source for a wide variety of bird and mammal populations. Major Chumash sites are directly associated with Area Five. Two are known to have been continuously occupied for between 8000 and 9600 years. Historical records from the SLO mission outline the story of all the families being removed from the village nestled against the northern hills of Sunset Palisades and relocated to the mission. Upon arrival families were torn apart. Husbands segregated from wives, mothers from children. Immediately to the south is the Pismu village site for which the present city of Pismo Beach is named; second is a coastal site in the heart of the Area Four. 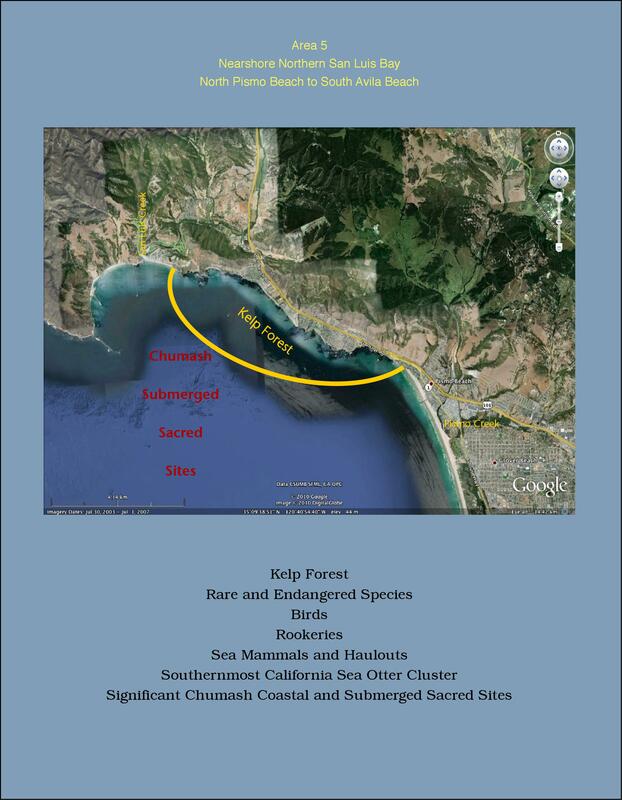 North along the coastal bench is a third site, where the Chumash have recently returned to renew their ritual ceremony cycle. Just north of the Area is the old Chumash capital of the area in Avila Beach. Its remains have been partially covered by rises in the level of the sea. 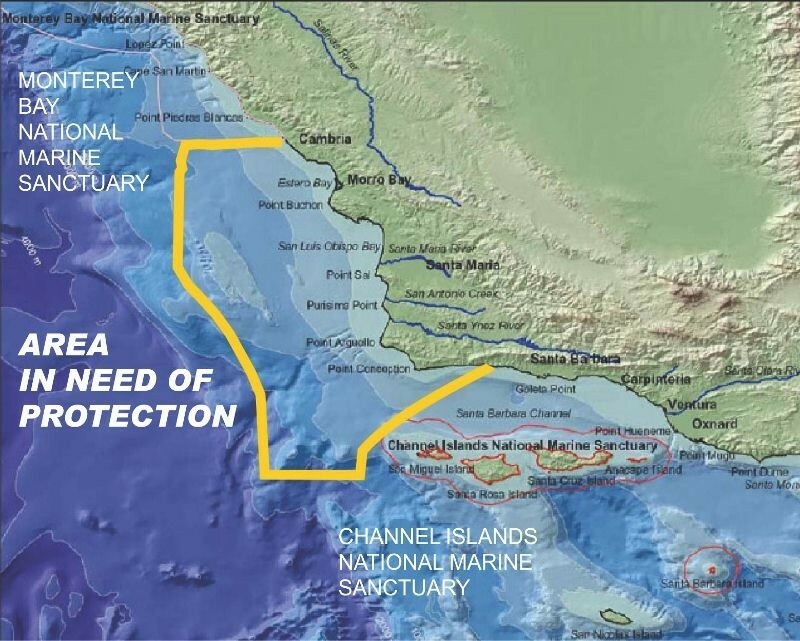 Also, other archaeological Chumash sites have been covered by ocean rise. Significant Chumash solstice alignments arrive from the interior passing through present coastal sites that 9,000 years ago were miles from the coast. Presently operating alignments pass along coastal benches and pass offshore to now submerged rock outcrops, similar to those on the Carrizo Plains, and pass beyond over areas once dry.